STREET CRY (IRE) (Bay or Brown 1998-Stud 2003). 5 wins-1 at 2, Dubai World Cup, Gr.1. Champion Aust. Sire 2015-16. Sire of 1522 rnrs, 1080 wnrs, 123 SW, inc. Winx (MVRC WS Cox P., Gr.1), Zenyatta, Street Sense, Oh Susanna, Shocking, Tomcito, New Year's Day, Whobegotyou, Long John, Street Boss, Pride of Dubai, Seventh Street, Heavens Above, Stay With Me, Lyric of Light, Victor's Cry, Majestic Roi, Here Comes Ben, Street Hero, Cry and Catch Me, etc. RAIMENT (f. by Street Cry). 5 wins-1 at 2-to 1400m, A$429,585, to 2016-17, ATC Birthday Card S., Gr.3, James HB Carr S., Gr.3, Pro-Ride 2YO P., Theraces H.-twice, 2d ATC Guy Walter S., Gr.2, Scone RC Woodlands S., L, ATC Turf Club H., Ranvet 2YO P., 3d ATC Triscay S., Gr.3. Gambeson (g. by Street Cry). See below. 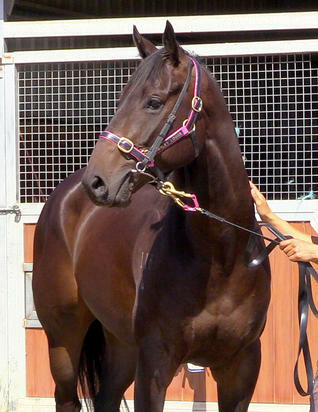 Culottes (f. by Lonhro). Placed to 2016-17 in Aust. Clothing. 6 wins. See above. Romp to Fame. 2 wins at 1400m, 1500m, A$86,600, WATC Express Powder Coaters H., Westspeed 3YO H., 2d WATC Westspeed 3YO H., Mt Hallowell Stud H., Ozbet.com.au H., Arctic Airconditioning H.
Shorts - Leader (Sing.). Winner at 1200m, QTC Manly Hotel P., 3d BTC Sky Channel H.
YOUTH (Quest for Fame). 5 wins-2 at 2-to 1400m, A$336,750, MVRC CS Hayes S., Gr.3, VRC Chubb S., L, MRC Barton S., L, VRC Flying Spur 2YO H., Hilton Nicholas 2YO H., 2d MRC Autumn S., Gr.3, VRC Chester Manifold S., L, PFD Food Services S., L, 4th MRC Christmas S., L, Mornington RC Hareeba S., L.
Veteran (Canny Lad). 2 wins at 1200m, A$173,140, STC Quality H., 2d NSW Tatt's RC Roman Consul S., Gr.3, MVRC William Inglis Cup, L, VRC Peters Drumstick S., L, 3d STC Pago Pago S., Gr.2, Skyline S., Gr.3, VATC Merson Cooper S., L.
The Entourage (Flying Spur). 5 wins-1 at 2-at 1000m, 1100m, A$397,250, WATC Eat More Fruit 2YO P., Westspeed 3YO H., Ronald Kett 40 Year Membership H., Westspeed 3YO H., Playeronline.com.au H., 2d WATC Beaufine S., L, WATC S., L.
Heart of a Warrior (Show a Heart). 5 wins from 1300m to 1700m, A$211,850, BRC Gallopers $1 Membership P., Getrealsupportteal H., Austcover P., Ipswich TC Ipswichcup2015 H., Channel 7 H., 2d BRC Titan Sheds H., 3d BRC Members' H, L.
Race Record: 6 Starts 0-1-1 A$11,100.